Ex-Rep. Corrine Brown Sentenced To 5 Years For Stealing From Bogus Charity : The Two-Way The former Democratic congresswoman, who was voted out by her Florida constituents last year, had been convicted of soliciting donations for a sham charity — then pocketing that cash herself. Former Rep. Corrine Brown, seen in 2015 in Tallahassee, Fla. She has been sentenced to five years in prison. 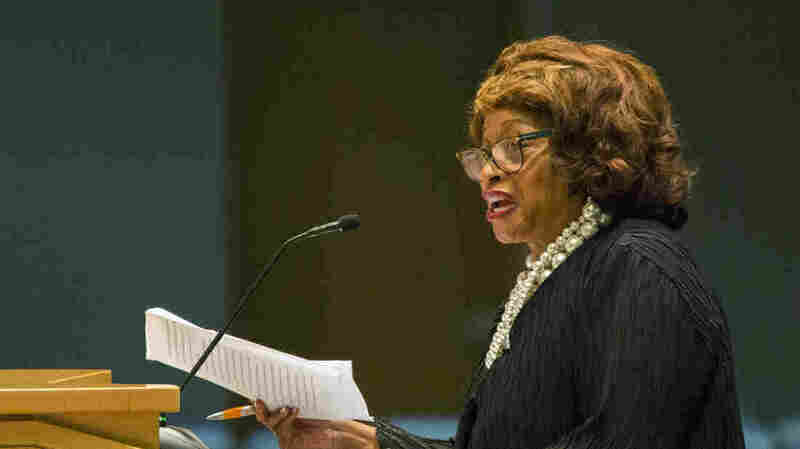 Former Rep. Corrine Brown has been sentenced to five years in prison for pocketing hundreds of thousands of dollars from donors who believed their money was going to charity. A federal judge on Monday sentenced the Florida Democrat, who was voted out of office last year, on 18 crimes ranging from conspiracy to fraud. "It is a sad day for everyone. It is a sad day for this community," Judge Timothy Corrigan said in court, according to The Associated Press. "I was impressed with all the outpouring of support for you and it's a tribute to you and the work you've done ... and that makes it more tragic and sad." The prison sentence marks the coup de grâce for Brown's political career, which at one time was lauded for its historic, trailblazing achievement. When she won election to the House in 1992, Brown became one of the first three African-American lawmakers from Florida to be elected to Congress since Reconstruction. Brown, 71, went on to serve 12 terms in the House until she lost last year's election under the cloud of her indictment. Yet during that long career Brown and her chief of staff, Elias "Ronnie" Simmons, had also been soliciting donations for One Door for Education — a group purportedly funding education for needy children, but really serving as a fig leaf for fraud. As member station WJCT reported, the two raised more than $830,000; just $1,200 actually went where they promised. The court found that the rest was siphoned into lavish events, when it wasn't going straight into the congresswoman's bank account. Simmons and Carla Wiley, the executive director of One Door, both accepted plea deals and reduced prison sentences for testifying against Brown, who in turn blamed all the wrongdoing on Simmons. Corrigan did not believe this explanation — though he did grant Brown a lighter sentence than the maximum for the crimes, which ranged up to nine years. Brown's lawyer has vowed to appeal.